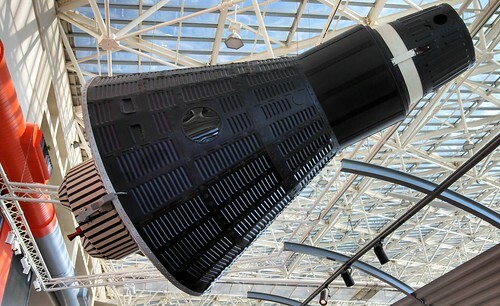 Project Gemini capsule, this was the first space project I followed (in elementary school). I remember once I persuaded my Mom to let me stay home from school (third grade) so I could watch a launch on TV. I think it was Gemini VI-A (15 December 1965) which was going up to rendezvous with Gemini VII, which was a critical technology to go to the moon. As a kid, I figured in fifty years we would explore the entire solar system. While the world has had some good success with robotic exploration, I still think there is so much more to explore. After spending much of my working career as an engineer, now I am learning biology, another frontier. Of course, I am excited by the synthesis of space and biology - astrobiology. I hope to live to see another form of life discovered somewhere in our solar system. Seen in the Museum of Flight, Seattle, Washington USA.